There are certain candies that are both obscure, and loved by a loyal fanbase. When referred to by name, it may get a mixed responses ranging from, “Huh?” to “Gimme!”; but once they get an eye on the familiar packaging, it’s clearly an old favorite. One such candy is Goetze’s Cow Tale, a chewy caramel rope that lassos in the fans after the first bite. One look at the friendly orange and white wrapper and you’re transported back to the first time you had a chomp on that Tale! Now, Goetze isn’t only known for the Cow Tale. They developed their first caramel all the way back in 1917! Their most famous pride and joy is their soft caramel cream – a candy that comes packaged as a typical caramel in twisted cellophane, but sports the now signature sweet cream filling. This sweet filled caramel, also known as the Bull’s Eye, went over so well that Goetze decided to invest a little time in creating a spin off product…and in 1984 the Cow Tale was born! This wasn’t Goetze’s first rodeo, so they knew what their customers wanted out of a caramel treat. At its core (literally!) Cow Tales are defined by the deliciously silky vanilla cream center. The cream carried over from the original Bull’s Eyes, and is part of what makes the Cow Tale so mouth watering-ly soft! The concept was that Cow Tales are a stretched out Bull’s Eye, so the candies are two bovines in the same stable. The cream is surrounded by a chewy caramel rope that makes the experience truly decadent. The entire Tale positively melts in your mouth, and features a texture that is truly unique: a mix between chewy, creamy, and velvety that gives the candy a rich flavor while keeping it light and not too sweet! 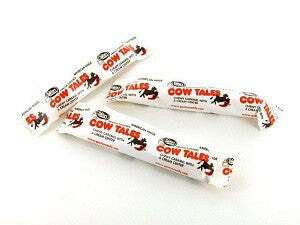 Cow Tales are a real treat for the tongue, and are sure to please when you’re on your next candy run. They come in bite size minis and a wide assortment of flavors including chocolate, strawberry, banana, and even caramel apple! Next time you get the chance, give a tug on that Cow Tale. It’ll have you begging for moooo-re!